Pyelonephritis is defined by inflammation of the kidney parenchyma and the renal pelvis, typically due to bacterial infection. Acute pyelonephritis can affect patients of all ages, however the highest incidence occurs in women aged 15-29. Pyelonephritis can be described as uncomplicated, when present in a structurally or functionally normal urinary tract in a non-immunocompromised host, or complicated*, when the opposite is true. *Urinary tract infections in males are complicated by definition, as they will be associated with abnormal urinary tracts. Acute pyelonephritis results from bacterial infection of the renal pelvis and parenchyma. Bacteria can reach the kidney either by ascending from the lower urinary tract, directly from the blood stream, as in cases of septicaemia or infective endocarditis or, rarely, via lymphatics (as seen in cases of retroperitoneal abscess). Neutrophils infiltrate the tubules and interstitium and cause suppurative inflammation. There are often small renal cortical abscesses and streaks of pus in the renal medulla. The most common organism* (~80%) isolated is Escherichia coli. Other organisms include, Klebsiella, Proteus, Enterococcus faecalis (catheters), Staphylococcus aureus (catheters), Staphylococcus saprophyticus (commensal), and Pseudomonas (catheters). The classical triad for pyelonephritis is of fever, unilateral loin pain (or rarely bilateral), and nausea & vomiting, typically developing over the course of 24-48 hours. Patients may also have symptoms of co-existing lower urinary tract infection (frequency, urgency, dysuria), as well as visible (or non-visible) haematuria. On examination, patients will often look unwell, often pyrexial and features of sepsis. They will have unilateral or bilateral costovertebral angle tenderness*, with or without suprapubic tenderness. Assess the patient’s fluid status and measure any post-void residual volumes. *Ensure to assess for evidence of an AAA, an important differential of back pain. Any patient present with back pain and tachycardia and / or hypotension, especially if elderly or with sufficient risk factors, should be assessed for a potential ruptured AAA. All patients will require urinalysis, assessing for nitrites and leucocytes, as well as a urinary beta-hCG for all women of child-bearing age. In all suspected cases, ensure to send off a urine culture (starting empirical treatment once sent). Routine bloods should be taken, including FBC and CRP for evidence of inflammation and U&Es, to assess renal function. All cases of pyelonephritis should have a renal US scan performed for evidence of obstruction (as an infected obstructed system is a urological emergency). If obstruction is suspected, non-contrast CT imaging of the renal tract should be performed (CT KUB). Patients who are systemically unwell will require management in an A to E approach and appropriate resuscitation. Start empirical antibiotics based on local protocols and IV fluids as appropriate, also prescribing suitable analgesia and anti-emetics. Tailor antibiotic therapy once sensitivities are available. Whilst many uncomplicated cases can often be treated in the community, consider admission in those cases who are clinically unstable, significant dehydration, or with co-morbidities such as diabetes mellitus, renal transplant graft, immunocompromised. Severe or non-responding cases may warrant catheterisation and high-dependency unit monitoring, as such cases can becoming profoundly and rapidly unwell. Consider early CT imaging* in such cases to check for obstruction and complications of pyelonephritis, such as of pyonephrosis (infected obstructed kidney) or a perinephric abscess. *Males without a clear underlying cause or risk factor for infection, many would advise that the patient be consider for further imaging (either US or CT KUB) and flexible cystoscopy, to rule out any identifiable underlying causes. 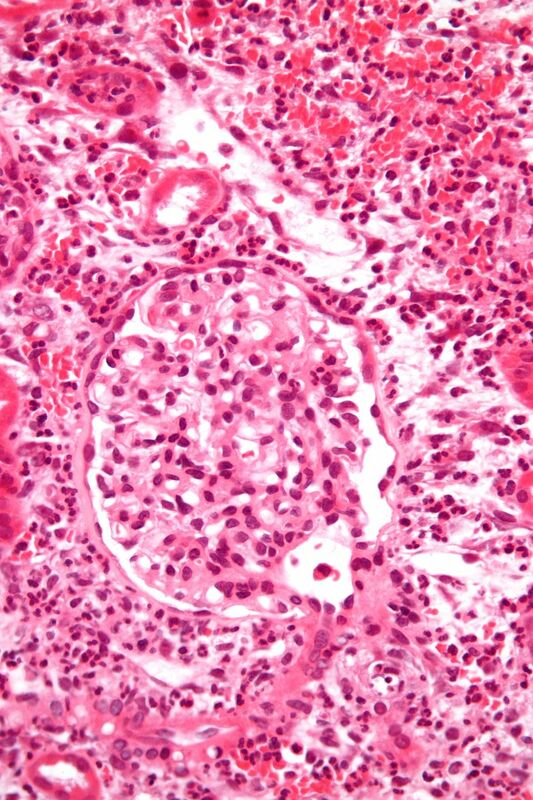 Repeated infections can lead to chronic pyelonephritis, with such repetitive inflammatory events leading to fibrosis (scarring) and ultimately destruction of the kidney. These cases are more common in obstructed systems resulting in urinary reflux, such as strictures caused by UTIs, VUR, other anatomical abnormalities. The diagnosis if often made radiologically when evidence of a small, scarred shrunken kidney is seen (Fig. 3). Chronic pyelonephritis is more common in children and can often present asymptomatic or with first presentation as chronic kidney disease. The mainstay of management is to reverse any underlying causes, optimise renal function, and consider prophylactic antibiotics. Emphysematous pyelonephritis is a rare and severe form of acute pyelonephritis, caused by gas-forming bacteria, and is associated with a high-mortality rate. It present similar to acute pyelonephritis, however typically with fail to respond to empirical IV antibiotics. CT imaging will show evidence of gas within and around the kidney. It is most common in diabetic patients, as the high glucose allows CO2 production from fermentation by enterobacteria. Pyelonephritis can affect all ages, more common in women. Risk factors include urinary tract obstruction due to stones, structural anomaly or enlarged prostate. Diagnosis should be made clinically with typical presentation of fever, flank pain and nausea/vomiting. 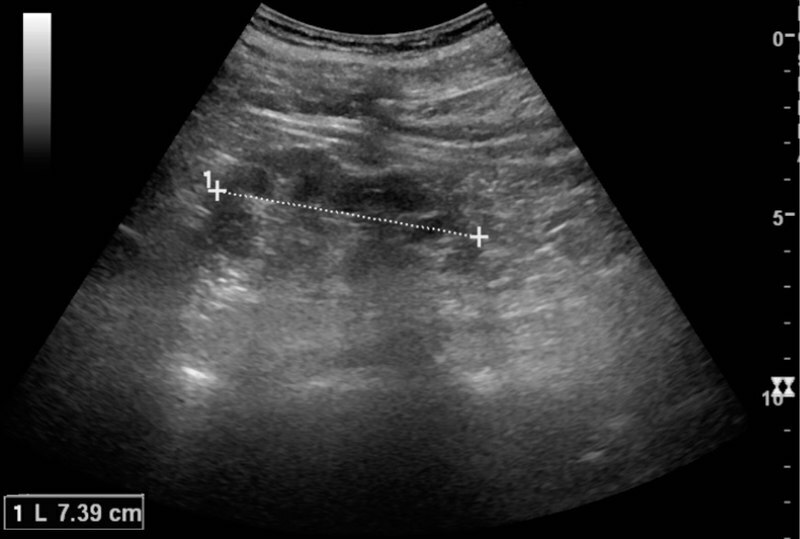 Positive urinalysis associated with flank pain necessitates treatment for pyelonephritis. Early recognition and treatment can prevent long term renal damage. If unresponsive to antibiotics, imaging should be performed to rule out pyonephrosis and perinephric abscess which require drainage. What is the most common organism responsible for pyelonephritis? Which of these is investigation to exclude pyonephrosis and perinephric abscess? A 64-year-old diabetic man presents to his GP with a 1-day history of right flank pain and vomiting. On further questioning, he has felt stinging when passing urine for the past 3 days and felt feverish. He is now unable to keep fluids down. On examination, he has a HR of 97bpm with renal angle tenderness, otherwise well. What is the most appropriate management? Which of these is a predisposing factor for chronic pyelonephritis?